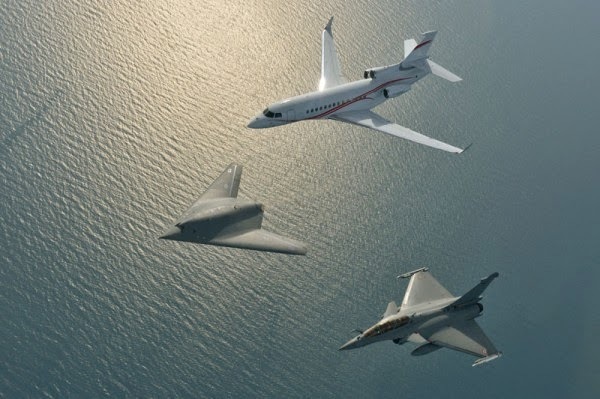 On March 20, 2014 Dassault Aviation has performed a unique formation flight in which the nEUROn unmanned combat air vehicle (UCAV) was flown in formation with a Rafale fighter and a Falcon 7X business jet, both produced by the company. Organizing a formation flight like this was a daunting challenge, company spokesperson explained, for each maneuver in the planned sequence, aircraft from different holding points and with very different characteristics had to fly alongside each other in a confined space. An additional challenge was being able to control the pilotless aircraft flying near four other aircraft – all manned (Rafale,Falcon 7X and two chase aircraft for photography). Engineers had to plan ahead to take into account the risk of interference, including aerodynamic turbulence between the aircraft. Preventing unexpected electromagnetic interference (EMI) with communications between the nEUROn drone and its ground control station was also a concern that had to be dealt with. “This achievement clearly reflects our expertise in state-of-the-art technologies. Our skills in both military and civil aviation mutually enrich each other, enabling us to design exceptional airplanes suited for both the armed forces and Falcon business jet operators.” Eric Trappier, Chairman and CEO of Dassault Aviation commented. This was the first time in the world that a combat drone flew in formation with other aircraft. Drones are often escorted by chase airplanes, as part of flight testing, but these are not performed as part of a formation flying, in which the drone’s handling is coordinated with the other aircraft in the formation. The entire operation lasted 110 minutes and took the patrol out over the Mediterranean to a range of several hundred kilometers.